The strength of a lemur couple's bond is reflected by the similarity of their scents, finds a new study. "It's like singing a duet, but with smells instead of sounds," said Christine Drea, a Duke University professor who supervised the study. Duke researchers sampled and analyzed scent secretions produced by lemurs known as Coquerel's sifakas living at the Duke Lemur Center in Durham, NC. The researchers also monitored the animals' scent-marking and sniffing behavior across the breeding season. They found that lemur lovers mirror each other's scent-marking behavior, and that lemur couples with kids give off similar scents—possibly as a way to combine territory defenses or to advertise their relationship status to the rest of their group, the researchers say. The lemurs spend the most time scent-marking and investigating each other's odors before they have kids. After they reproduce, they smell more like each other. The findings appear in the February 2014 edition of Animal Behaviour. Coquerel's sifakas are white-furred lemurs with chocolate-brown patches on their chests, arms and legs. They have glands on their throats and genital areas that produce a sticky goo that is dabbed on branches and tree trunks as the animals move through the forest. To collect the data, the researchers used cotton swabs to sample scent secretions from the genital regions of eight males and seven females across different phases of the reproductive season. Gas chromatography and mass spectrometry tests to identify the chemical ingredients in each animal's unique aroma showed that sifaka scent secretions from the genital area alone contain more than 250 odor compounds. The researchers also followed the behavior of six pairs of potential mates, measuring how often the animals smeared their scents on their surroundings—a behavior known as scent-marking—as well as how often they sniffed, licked, or marked over the scents left by other members of their group. The animals mirrored the scent-marking behavior of their partners. "When one member of a pair started sniffing and scent-marking more often, their mate did too," said Lydia Greene, a research associate in the Department of Evolutionary Anthropology who conducted the study as a Duke undergraduate. The couples without offspring that spend more time on scent-marking and investigating each other's odors may be in a 'getting-to-know-you' period, the researchers say. "If two animals have never reproduced, the male doesn't necessarily know what the female smells like when she's in heat, because they've never gone through this before. They might need to scent mark a lot more to figure out when it's time to mate," Greene said. Sifaka couples with kids spent less time scent-marking and investigating each other's odors, but their odor profiles were more similar than those of couples without kids, possibly due to the exchange of odor-producing bacteria during mating, grooming, or other forms of physical contact. Surprisingly, the number of years a couple had lived together made no difference to their mating success or the similarity of their scents. 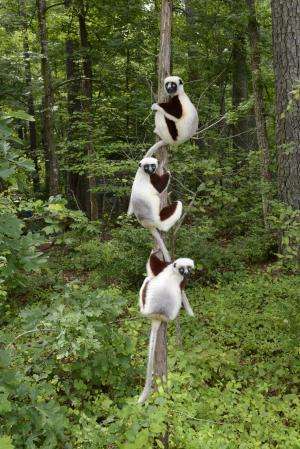 "Some of the sifaka couples had been living together for quite a while, but hadn't managed to produce an infant, whereas others had been living together for a really short period of time and had already successfully reproduced," Greene said. Figuring out what the sifakas' chemical messages mean will take more time. The scent secretions of other lemur species contain hundreds of odor compounds that help the animals distinguish males from females, mark the boundaries of their territories, even tell when a female is fertile or sniff out the best mates. By sharing similar scent signals, sifaka couples could be jointly defending their territories, or advertising their bond to other lemurs in the group. "It could be a signal that they're a united front," Drea said. "[They could be saying] we're a thing. We've bonded. Don't mess with us," Greene added.